Here's a look at the cover of the next Informer issue (available late October 2018). Baby Face Nelson and the 'Tape Bandits' by Jeffery S. King. 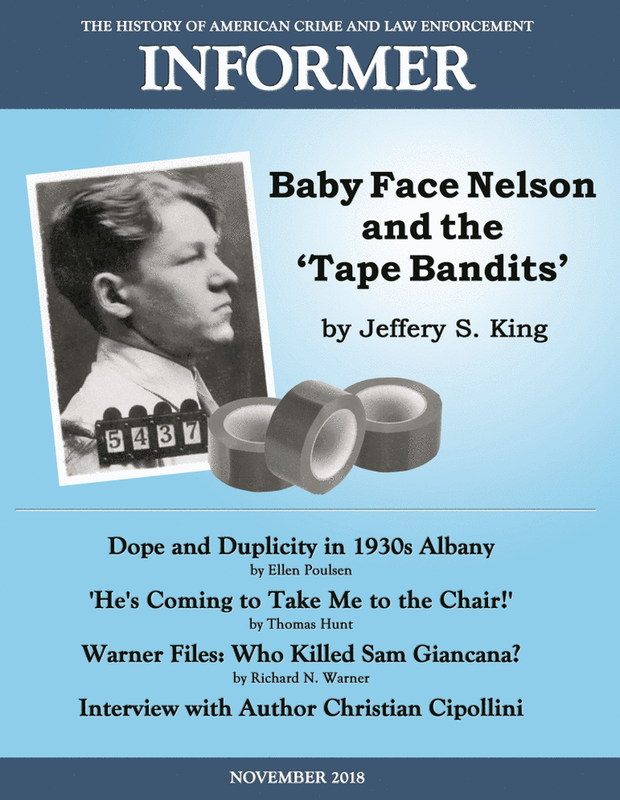 Dope and duplicity in 1930s Albany (conviction and execution of Anna Antonio) by Ellen Poulsen. 'He's coming to take me to the chair' (Petrosino frees convicted killer) by Thomas Hunt. Book Reviews: Behind the Murder Curtain, Ghost: My Thirty Years as an FBI Undercover Agent. Book Notes: Inspector Oldfield and the Black Hand Society, Carmine the Snake, Chasing Dillinger. Warner Files: Who killed Sam Giancana? by Richard N. Warner. Just One More Thing: Wherefore art thou, Romeo? (New Orleans lynch victim Frank Romeo) by Thomas Hunt.